I seem to repeat this sentence a lot when ive created a meal: I threw this together with what ingredients I could find. The sweetness of the pumpkin, earthiness of beetroot & saltiness of haloumi work really well together. It’s not often I eat a savoury meal without green – the baby kale just adds a bit of freshness. Cheese is such a fabulous ingredient to bring a different flavour to a dish or balance out flavours – ive used Haloumi in this one but Grana Padano, Persian feta & goats cheese are normally present in my fridge most of the time. 1. heat the oven to 180 degrees Celsius (I do not have a fancy-pants oven; it’s a standard Fisher & Paykel so this is what I base my temperatures on). 5. set the timer for 45 minutes-1 hour. While it’s in the oven, slice the button mushrooms into thirds, slice the haloumi & measure out the baby kale. 6. with 10 minutes left on your timer: pan-fry the haloumi with 1-2 tspns olive oil. Flip once, then put on paper towel to drain any excess oil. 8. take the pumpkin & beetroot out of the oven, slice the beetroot into smaller pieces. Arrange everything in a bowl & eat! I had it cold but it would be delicious warm too. **if you have raw pine nuts, you can dry roast them in the frying pan once you’ve removed the kale & mushrooms. Just throw them in & stir A LOT or they will burn. It only needs 30-90 seconds depending on the heat of your stove. 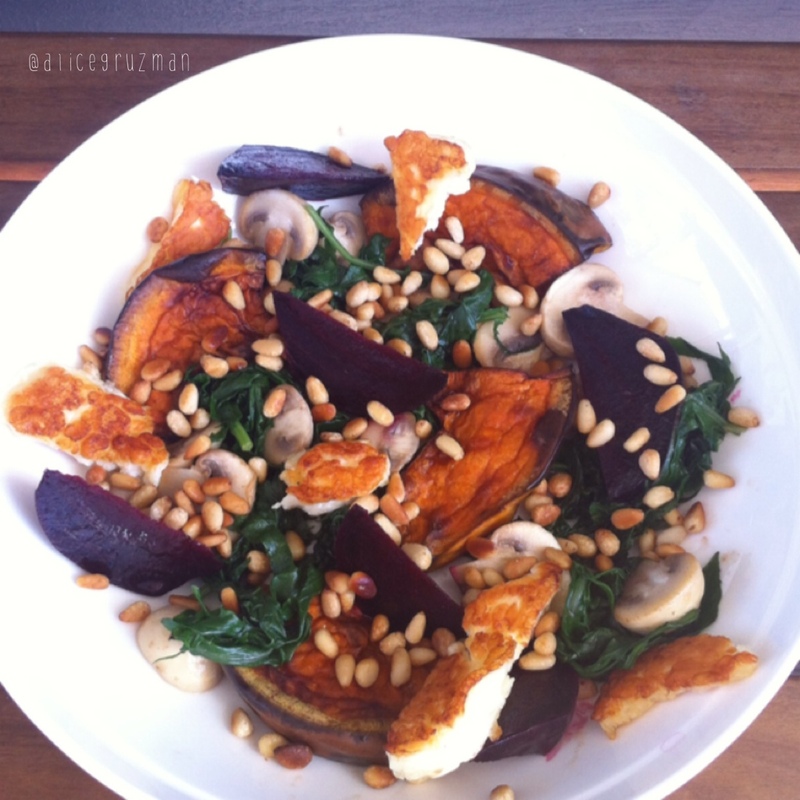 This entry was posted in Recipe and tagged australianproduce, beetroot, cleaneating, glutenfree, haloumi, healthyeating, iqs, iqs8wp, pumpkin, salad, sugarfree, vegetables, vegetarian by 6 Clean Ingredients. Bookmark the permalink.